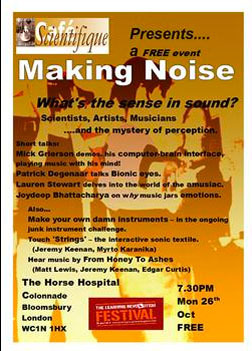 Cafe Scientifique presents Making Noise, a night of perceptual exploration :: October 26, 2009; 7:30 p.m. :: The Horse Hospital, 30 Colonnade, WC1N 1JD, London, UK. Join our scientists, artists and musicians as we ask the questions: When does noise gain meaning? And – Are we nearly cyborgs? Short talks by Dr Mick Grierson’s demo of his computer brain interface – generating noise environments from brain waves! Patrick Degenaar, on visual prosthetics for augmented vision – and the prospects for bionic eyes. Lauren Stewart on what our brain does with music, and why some people (with amusia) just don’t get it. And Joydeep Bhattacharya on why sounds stir our emotions. Also: Strings – an interactive sonic textile installation you can play. Ongoing junk instrument workshop with Ella & Iain from Shootin’ Breeze, and Electronic music by From Honey to Ashes with their custom built sound environments. There will be talks and there will be sounds. Take some in and make your own! This events is sponsored by BIS as part of The Learning Revolution Festival.